Beauty product lovers rejoice because you'll be able to find everything you want and need at the Ulta Black Friday sale for 2017. Ulta Beauty has pages of Black Friday beauty busters that include the best brands such as Urban Decay, NYX, CHI, Clinique, and Tarte. They have great prices on makeup, skincare, styling tools, and much more. If you plan on doing more Black Friday shopping this year, I also have the best deals at Kmart for 2017, the best laptop deals this year, and some freebies you can pick up. You're also going to love these Sephora freebies, free beauty samples you can get in the mail, and ​how you can get free L'Oreal products. You can shop Ulta's Black Friday sale at your local Ulta beginning at 6 pm. Thanksgiving Day. They'll be open until 2 am. but then will open back up on Black Friday 6 am to 10 pm. The sale is also good on Saturday from 9 am to 9 pm. 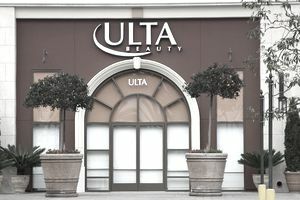 All the deals will be available at Ulta.com starting at 6 pm on Thanksgiving Day. Here are Ulta's Black Friday 2017 offers divided into categories of makeup, fragrance, beauty tools, gift sets, skincare, haircare, and body. The brands are ordered alphabetically, making it easy to find your favorites. Here's the Ulta Black Friday 2017 ad scan if you'd like to see all the photos. There are lots of fans of Ulta's stocking stuffers they offer every year so it's no surprise they're doing it again. You can get 75+ stocking stuffers that include makeup, face masks, bubble baths, and more. These are 5 for $5, making them great stocking stuffers or small gifts for friends. There's also a $3.50 off $15 or more coupon that's in the ad this year. It has the usual restrictions, so keep that in mind while you're shopping. Makeup is always a big part of Ulta's Black Friday sale and this year is no exception. There's a great mix of highlighters, eyeshadows, mascaras, palettes, and lipsticks from your favorite brands such as Benefit, Tarte, Too Faced, and Urban Decay. There are a few fragrance deals available at Ulta this Black Friday on Clinique and some sampler sets. You're also eligible for a free Tumbler Set Gift Box with a fragrance purchase of $40 or more. Gift sets are popular Christmas gifts and here are a few great ones from Clinique. There are other gift sets in the other categories, but these sets combine makeup and skincare products. Just one skincare Black Friday offer from Ulta this year, it's a fun little sampler. It's a great time to stock up on jumbo hair care products including shampoo, conditioner, and styling products. There's a great deal on OPI nail polishes this year and a fun Ulta nail kit that would make a great stocking stuffer. The Body Shop products are on sale as well as Bliss, Philosophy, and Ulta Beauty brands. Here are Ulta's Black Friday deals for your body.